Hikawa Shrine in Kawagoe is well-known as a shrine of relationships and matchmaking. We have listed up eight things that you shouldn't miss out when visiting Hikawa JInja. Have you ever wished to encounter your true love in the most romantic storybook way possible? Perhaps Kawagoe Hikawa Shrine in Kawagoe city, Saitama, would be able to grant that wish. In this article, we will introduce you to things you can do at Kawagoe Hikawa Shrine, such as sending off dolls down the river and trying out red snapper good luck lotteries. The Kawagoe Hikawa Shrine is said to be approximately 1500 years old and is where five deities are enshrined: Susanoo no Mikoto, Kushinadahime no Mikoto, Ashinazuchi no Mikoto, Tenazuchi no Mikoto, and Oonamuchi no Mikoto. With two sets of deities that are regarded as married couples, the shrine has been historically worshiped for "matrimonial happiness", "happiness in the family" and the "deity of matchmaking". We first enter the shrine grounds after passing under the bright orange torii gates. Soaring tall at 15 meters, this is said to be the largest wooden torii gate in Japan. When you first visit the shrine, purify your hands at the chozuya (an area with water to clean your hands and mouth) before entering. Please read How to Visit a Shrine for more details. 1. Blow three times on the washi paper called the ‘hitogata’ (human-shaped paper). 2. Rub the hitogata paper on yourself. 3. Release the hitogata paper into the river while chanting "harai tamae, kiyome tamae" (atone and purify). The purpose of this ritual is to cleanse one's sins. Aside from the main shrine and the hall of worship, there are many smaller shrines and holy trees throughout the shrine grounds. These are all known as spots where you can be blessed. Get a special paper at the shrine office with the seal stamp of the shrine. You can collect seal stamps (goshuin) from the various sacred spots that you visit. For more information about seal stamps, please read Collect Seal Stamps from Japanese Temples and Shrines. In the back of the main temple, there are two massive zelkova trees that are said to be over 600 years old. Around these two holy trees, a stone path is built and when you walk around the tree in the shape of the number 8, it is said that you will gain a spiritual power of some sort. At Kawagoe Hikawa Shrine, the ema (wooden prayer plates) are dedicated to the shrine in a tunnel shape. The way the light shines through the ema creates a beautiful sight. How about going through this tunnel of plates filled with people's wishes? In order to have your luck improve, let's try reading an omikuji (luck diving paper). There are the standard omikuji, but the ones that are the most popular are the ‘ichinen antai mikuji’ (one year of safety lottery) and the "ai tai mikuji" (encounter lottery) for 300 yen each. The ’tai’ in the lottery names and the ’tai’ for red snapper are a Japanese pun on the word for good luck. After you take the omikuji paper out of the red snapper, you can keep it as a charm! Don't forget to purchase a charm for matchmaking from the shrine office. 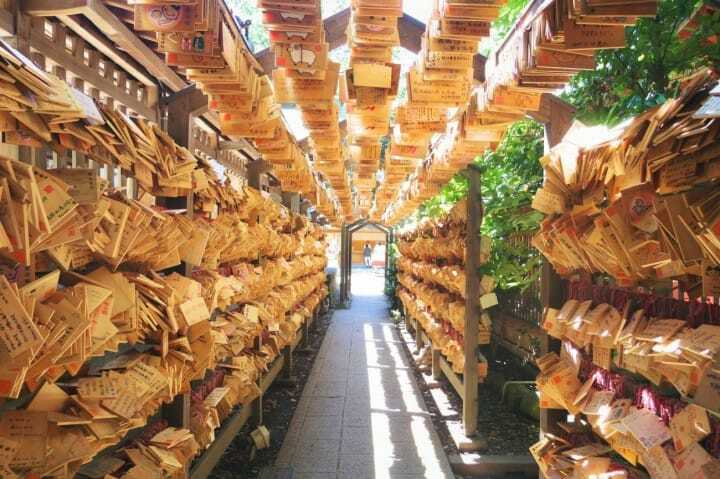 This ‘red pencil’ is a special charm that can only be found in Kawagoe Hikawa Shrine. It is designed after the "red string of fate" that is said to connect you to the one you are fated to. The more you use the pencil, the closer the fated person gets. If you plan on visiting the shrine in the morning, you may be able to get the matchmaking stone. At Kawagoe Hikawa Shrine, it has been said that "if you take home the gravel of the shrine grounds and treasure it, you will be blessed with a good relationship". At 8 o’clock in the morning, the first 20 people that arrive there are eligible to receive the blessed white gravel from the shrine that has been wrapped in a linen net by a Miko priestess. It is said to have great strength and many people come to see the stones from early in the morning. If you do find someone you can spend your life with after this, visit the shrine together and return the matchmaking stone. In return, you will receive a special charm in the shape of a red string called the ‘yui himo no moto’ (source of tying knots). At Kawagoe Hikawa Shrine, you can also receive the holy water or send prayers to the ‘inu iwa’, or dog stone, for children and safe birth. After cleansing your sins and saying a prayer, you may be able to encounter a wonderful match by visiting Kawagoe Hikawa Shrine. And at the Hikawa Kaikan next door, there is the omusubi rice ball cafe that is also great to stop by.